Welcome to this page, where items for sale are listed along with photos. There are no price tags on the individual items. Feel free to make an offer, and we will take it from there. In some cases there will be several units of the same kind. Just ask if any questions pop up. 8 channel Analogue to Digital converter - super sounding! 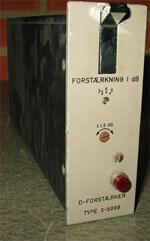 Valve mic pre amp from the sixties, originally made for the Danish National Radio. The sound is very neutral, and adds "life" to the signal being processed. Several units for sale. 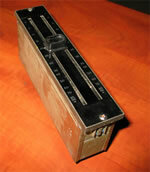 This unit was the electronic part of the lyrec tape (mono) recorder form the sixties. The circuit is build on valves, and the unit holds many spare parts, such as trafoes, etc. Several units for sale. 24 channel read all formats - output all formats. Very practical when doing digital transfers. Synchronizer for Pro Tools mix systems. Custom build device for the Danish National Radio, to run Euro vision Broadcast programs. From the Sixties. Contains many spare parts and circuit cards. Valve pre amp with eq. 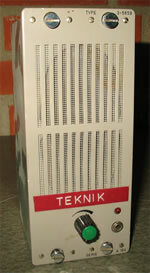 8" Super full tone speakers, manufactured in the Sixties. Needs circuit replacement. AKG K-48 Headset with Mic. 100 Watt output amp (mono). May need repair. Digital sampler with 128 MB ram and HD. 8 individual outputs, 2 inputs. Digital in/out as well - super sounding! 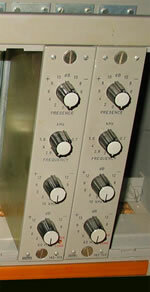 Joe Meek Enhancer VC4 - eq. 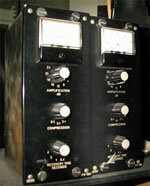 2 channel Compressor/Expander. May need maintenance. MCI 24 Track Analogue Tape Recorder with remote control. One of two for sale. If interested, all units necessary for synchronizing two machines, are also available for sale. (original MCI synchronizers)These machines are some of the best recorders for music production, with ultra fast dropping. 8 track analogue multitracker - super sounding! Need maintenance. MCI 2 Track Analogue Tape Recorder. Need maintenance. 24 channel Digital stand alone_recorder - super sounding! 6 voices Analogue moog synthesizer - super sounding! Need maintenance. Eventide Harmonizer, the very first of it`s kind! Essential for the old Queen-productions, etc. 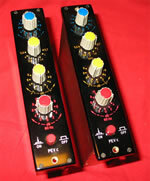 3 channel Digital delay lines, build primary for live pa to compensate for the speed of sound. The rack has got 5 slots. 3 racks available. Digital Reverb - super sounding! Analogue time delay - Great device. Ntp rack for the radio standard. Fit`s all Ntp, Neumann modules, etc. Analogue eq module. several available. Mic Pre Amp (Like Neve modules)- super sounding! Line amps, 9 pcs in rackmount. Analogue mixing board, need maintenance. 16 channels of Midi controlled vca`s, allows you to insert in analogue mixer with no automation. Gives you automated mixing! Digital mixer, including full meter bridge. TC Unity small sized expansion card for yamaha o2r mixer. 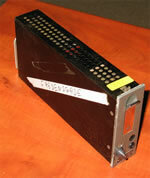 Gives you 8 in/out digital channels (AES-EBU) as well as a double tc effect rack, with reverbs, dynamics, etc. - super sounding! 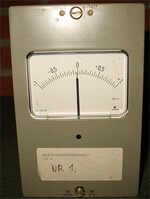 Digital recording interface. 2 in/ 4 out. Analogue casette tape recorder - super sounding! Classic headset. Mic can be removed if wanted. Space tool - make wide stereo. 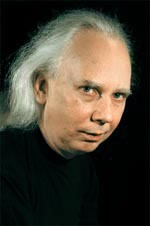 Electronic organ. The sound of "The Doors". Vox Wah, Fuzz face orig. from the sixties, auto wah, tc phaser from the seventies. Exabyte tapedrive. For backup system. (Many data-tapes as well). The "Diesel Truck" of yesterdays computers. 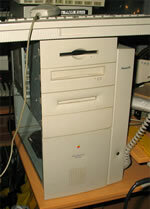 With 6 slots, scsi,etc. Has a G3 processor (Max power). Ultra wide scsi drives, 34 Gb - 18 GB - 9 GB versions, including cable. 1 GB removable harddisk drive. about 40 cartridges for sale. NTP Compressor 179-100 - super sounding! Newly adjusted. NTP 182-100 coloured version - super sounding! NTP Meter 177-210, very nice to show "energy" in your mix, Big display (3 cassette units). 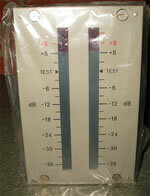 NTP Phase meter Type 4-13457, Big display (3 cassette units). 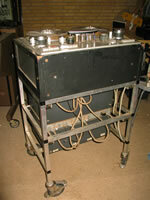 TAB V74, valve driven line amp. 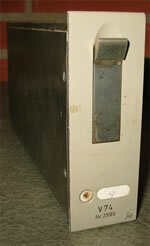 19" Racksize Bosch Power supply, Bosch Fernsehen rack. Haller relais from the Bosch Fernsehen rack. Original JS trafoes for power supply.